Lydia Palmer has represented self-insured and state fund employers in Washington workers’ compensation matters since 2014. 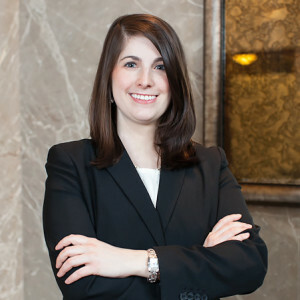 She joined Holmes Weddle & Barcott as an associate attorney in 2018. Prior to practicing workers’ compensation defense, she worked at K&L Gates assisting with discovery in preparation of litigation involving complex claims. She also worked as an associate attorney at a general practice law firm in Missouri, where she regularly participated in alternative dispute resolution and court hearings. During law school, Ms. Palmer earned a Certificate of Dispute Resolution and a CALI Award for a legal research and writing class. She also had the opportunity to serve as a judicial extern with the Honorable Nanette Laughrey, U.S. District Judge.